Just check out this page from the 1996 brochure...of which I used to have a copy of. Toyota was taking a major leap of faith on this concept, because even though today the CUV is as common as self checkout or autocorrect flails no one, up to this point, wanted to stray far from the money making formula of putting a wagon body on a truck chassis and calling it an SUV. Toyota, however began to realize early on that there would be a market for utility vehicle for the less overtly rugged and those looking for a more civilized vehicle with the ability to handle inclimate weather and haul lots of gear without beating you up in the spine or at the pump. Not only more civil, but even FUN! Need proof? Check out this funky 1989 concept. Um paging Torchinsky much? Its a tiny 2 door convertable off roader with a freakin' dirt bike in in it! Granted, this was Japan...in the 90's...so of course it was going to be weird. The good news is that in the time between this concept and the actual production model went on sale in 1994 (1996 in the US) it lost only a small amount of its quirky charm. Yes, its got a real body and no its doesn't have a bike in it, but they did offer it with twin removable panels and we eventually got a convertible version...for real. The best part about the 1st RAV4 though, wasn't its exterior styling it was the fun and quirkiness baked in. Those seats, for example, not only featured very thick and durable coverings made from pure ground up NES cartridges (presumably) they were also able to be reconfigured to lay flat so you could have a place to rest from your busy life of Surge™ rushes and burning mix CD's from songs you got off Napster. They also held an ungodly amount of stuff, thanks in part to their tall shape and LOW, flat load floor with no sill or bumper that didn't have to deal with trying to store a full size spare tire, because it was hanging out on the enormous rear hatch. I can tell from personally living in mine for a week, they work fine as a home. Speaking of space I once ferried 9 bikes 2 people and a weeks worth of clothing for 9 people from Salt Lake to Sedona Arizon (5 bikes upright in the back, 4 on the roof) with nary a problem, even when it was puking snow over the pass near Humphreys peak as it always did on spring break for some reason. It was also rated to tow 1500 lbs but I wouldn't, well, again i mean (that poor clutch). And the interior was a mishmash of partsbin Toyota and bespoke. The end result was a 2 door or 4 door, 4 wheel drive vehicle with a 5 speed manual or 4 speed auto that could swallow up to 5 people and 35 cubic feet (or 60 with 2 people) tow 1500 lbs and had enough tire and clearance to go anywhere the SUV owner of the 90's (and today) needed to go. Capability is hardly the signature trait of the CUV class anymore, hell you'd be luck to make it up a snowy hill with some of them, but the RAV4 was legit off-road. The 4 speed had an autolocking open center diff and the 5 speed had a manually locking viscous coupling center diff. With good approach and departure angles, 70 series tires, true high range 4wd and decent angles ensured you didn't get stuck. Chassis dynamics were something that didn't really exists in the SUV class before the Rav4, which anyone who remembers, say, an Eddie Bauer Explorer of that vintage could tell you but it the RAV4 did alright. No, it wasn't a "sporting" drive; With only a single tiny roll bar body roll was epic and the brakes were REALLY not up to the task of canyon carving (I had never seen brakes on fire before that night). However, the steering, brake pedal and throttle response were linear and alive and you could really have a great time at below legal speeds. The thick small diameter wheel had a sense of being unassisted, the shifts were short and precise and it was also available, with a legit Torsen rear differential (Shared with the Celica All-trac of rally fame) which aided greatly in its planted and surefooted nature in the corners. It wasn't a car that would BE fast, but it was always a car that made you smile. The slowest Rally car ever. Power was...um...conservative at 120 hp and 125 ft-lbs from a naturally aspirated 2.0 I4 but because of its square design, it was pretty flexible and got along just fine so long as you didn't want to go fast. That it only weighed only one average person away from a Miata (2600-2800 lbs dripping wet), it make out alright. The engine also had a wonderful character that, although slow, was eager and exciting and it made a wonderful noise. How fast slow was it? A conservative 0-60 was 12 seconds with the manual but once you got up to mountainous elevations with passengers or gear it was more like....well we'll get there. I remember on a certain drive from Salt Lake to Colorado Springs with two bikes on the roof the combination of altitude and extra drag was enough that with just me and a light load of gear onboard, it couldn't maintain freeway speeds on the taller hills and spent a lot of time in 3rd at 5000 rpm. This was easily remedied on the way back by putting the bikes in the car of which there was PLENTY of space for. Mileage for the 4 door manual was mid 19/24 city/highway and you would get 22 in practice but as "meh" as that sounds now, it was 8 mpg better than an explorer of its time and 3 better than the smaller engined Samurai so not too bad really. The numbers don't really tell the whole story though, as is the case with many cars, and the RAV4 was charming and endeering in ways not easily measured and the people who drive them fell in love with them. So much so that other companies, inspired by Toyota's instant success in Japan and the US, were scrambling to build their own "not trucks", including the CR-V, the Forester (and to a lesser extend the outback) and the like which started the ball rolling for the Crossover movement to take hold. Now I know you don't like crossovers and for several valid reasons; pointless tall wagons that weigh more and have less interior space. I should also say that I don't disagree, I don't really like that the crossover has replaced the wagon AND the SUV and so I generally share your disdain for the modern crossover. The main reason I dislike them, though, is the main reason I LOVED my RAV4. The RAV4 was honest, mechanical and capable. It didn't trade on past legacy (what legacy?) or up to the minute technology (cassette deck yo), it wasn't trying to be all things to all people nor was it a cheap excuse to sit a little higher up than the average motorist... it was just good, honest engineering meant to do what it said on the tin. If anything, The AX10 chassis RAV4 makes me wistful, in the same way an e39 BMW or an international Scout does, for vehicles that didn't need to conform to the data sets, or please the most people. Vehicles like these were built to please or to perform one person and were risk taking machines that paid off. Sadly in a data metric world, the formulas for such success are given to dilution to the base elements that...yes...bring success but also erode the very heart of the vehicle too. 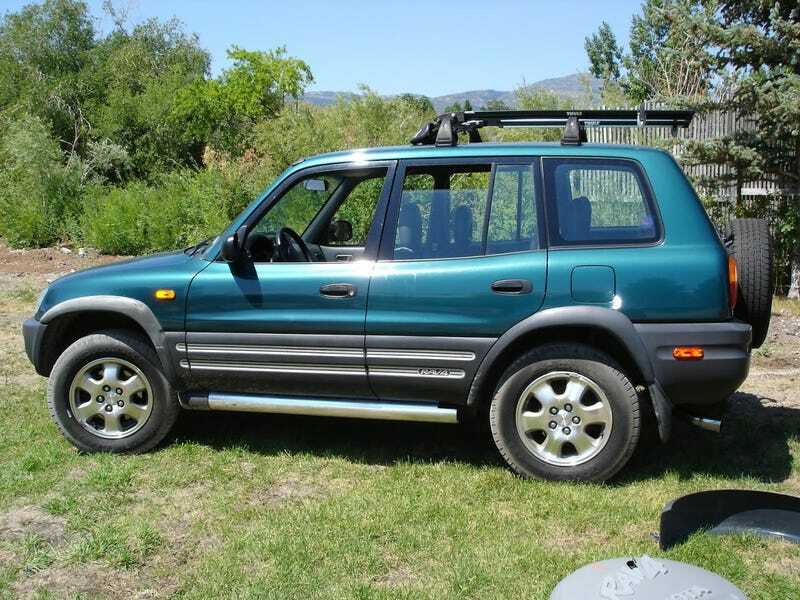 Sadly, my RAV4 story ended prematurely after, on an early morning drive in the canyons, rowing the gears on my Torsen equipped 5 speed Sequoia green metallic example with over 150,000 miles and more memories I can count met with a deer that was pretending to be a road sign. A credit to the old Toyota, it was still drivable and I still drove it like this for a while before it was sold to a salvage company out in Florida someplace. God speed little RAV4. At least you didn't live to see what became of your name.